I deliberated long and hard in the week leading up to last Saturday as to which parkrun I would do that weekend. Having completed 119 parkruns, 67 at Griffeen and 36 at Castletown, I’m trying out a bit of parkrun tourism at the moment. I’ve run a total of 10 different venues (all of them in Ireland) and want to add to that tally. I’ve recently visited Mullingar and Longford for their birthdays and will go to Tymon this weekend for theirs. While Dundalk was celebrating its anniversary on Saturday, it wasn’t feasible for me to go there, not least because I knew I would be out all day on Monday at the Women’s Mini Marathon. There’s only so much family abandonment I’ll get away with. So at the last minute, I decided that I would join my brother at his home parkrun in Marlay. My brother, Gerry, is a member of the little known club called the ‘If Teresa McCarthy can do it, anyone can do it’ club. He began running after listening to me go on and on about couch to 5k, getting out there, running for physical and mental fitness, blah, blah. I encouraged him to get started and I introduced him to his first parkrun in Griffeen. He has now done 26 parkruns at half a dozen venues and has run two 5-milers too. And he will still admit that he often finds himself thinking that if big sis can do it (at her age – cheek!) then so can he. “You can’t follow that with ‘Castletown, Celbridge’. Gerry: You can’t compete with Nottingham, Manchester and London. Me: parkrun is never about competition. Gerry had no answer to that! I also met up with my lovely running friend and fellow Castletown parkrunner, Carla. Carla and I regularly car-share to parkruns or races. This is the same Carla that has somehow persuaded me to sign up to the Howth Summit 5 Mile this Sunday morning and I don’t quite know how she did it. On Saturday morning she had brought her husband and young children along, and they were using the great playground at the start/finish line while Carla ran – perfect. Warm-up completed, I reckoned I was set up for a great run. It all started so well, first 2k and I was holding a very reasonable pace. Then it all went pear-shaped, and I don’t even know why. I just had no running left in me. Maybe it was the heat, maybe I wasn’t properly hydrated in the previous few days (always an issue for me), maybe the sports massage hadn’t quite worked its magic yet. But I decided not to stress about it, not to over-analyse it, just to go with it. Maybe it just wasn’t happening for me that day and that’s okay. But it was a most beautiful parkrun. Firstly, I was struck by the sheer numbers of people filling the path as far as the eye could see up the gentle incline for the first kilometre or so. Then I was enthralled by so many different scenes that emerged over the course of the run. There were the shady woods with the birds singing, the ponds, the bridges, the Big House, then the stunning house in the middle of the woods. I never knew what I would see next. In and out of wooded areas providing cool shade against the hot morning sun. For the first time ever, I stopped and took photos – it had to be done. In and out of the woods, sunshine, shade, water features. (Note to self, need to practice taking photos – the ones I took just don’t do the venue justice). 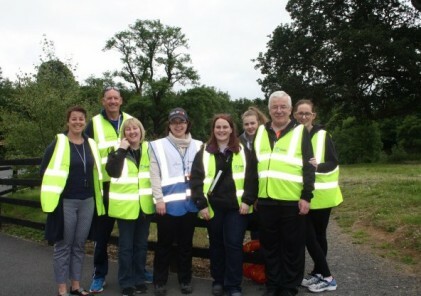 One of the other reasons I wanted to go to Marlay parkrun was to see how they manage the sheer numbers, how they work the finish chute and hand out the tokens, how they deal with the queues for barcode scanning. But sure by the time I came in in position 433, there were no queues. I reckon most of the parkrunners were already tucking into their hot dogs at the Marlay Farmer’s Market. I was so late finishing that my brother and I had to leave immediately, so I had no opportunity to chat with other parkrunners nor the volunteers. (Again, Gerry should know that this is the kind of thing I do at parkruns!). So, as far as running is concerned, this would have to go down as an epic fail. But as far as parkrunning is concerned, it was glorious. 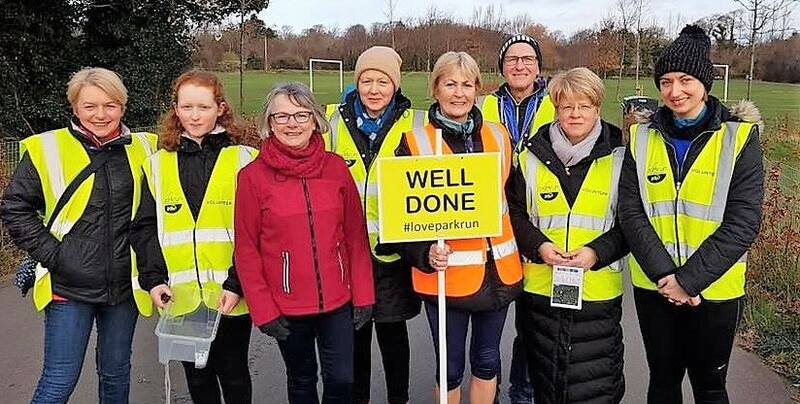 Marlay parkrun has so much to offer, not just as a parkrun route but as a total venue, with the playground, the coffee shop and the market. For me, it was a day to just walk and enjoy being out there, getting fresh air and exercise, improving my physical and mental fitness. I absolutely loved it. There was so much to appreciate. What a privilege to get to run in such a lovely place at the foothills of the Dublin Mountains. parkrun number 120 done, 11th different venue. Thank you to everyone at Marlay parkrun. It is a wonderful venue and so well organised. You should be very proud.